The What: Chief has launched a new modular approach to multi-display solutions. 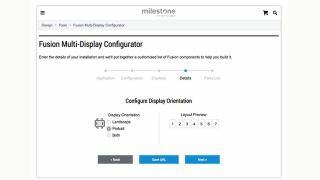 The Fusion Modular Series uses common components of Fusion multi-display mounts and a new online configurator to give customers the ability to build and order the parts necessary to meet their exact application requirements. The What Else: Customers will be able to buy the pieces of Fusion needed to create multi-display installations to order. The tool will provide the user with the correct length of extrusion as well as the number and type of interface brackets and wall plates. The first phase includes wall- and ceiling-mounted menu boards. Multi-row ceiling mounts will be added later this year. Features of the new configurator include support for any menu board configuration and flexibility for non-standard installs, such as multiple display sizes, and mixed portrait/landscape and gaps between displays. The mobile-friendly configurator is built directly in to milestone.com and integrated with Chief’s MountFinder database. Users with accounts can see MSRP pricing and order directly from milestone.com, and configuration URLs can be saved for future reference. The Mounting System maintains the installation benefits of standard Fusion Menu Boards and is compatible with a suite of standard Fusion accessories. The Bottom Line: With the new Modular Series mounts and online configurator, users can input the number of displays, display model, and configuration details and the tool creates a list of all the parts needed to safely build it.